Nb metal gives asymmetric Nb3d peak shapes, but Nb oxides have symmetric peak shapes. Nb3d region has significantly split spin-orbit components (Δ=2.78 eV). For Nb oxides, the FWHM of the Nb3d peaks is the same, for Nb metal the Nb3d3/2 peak is much broader than the Nb3d5/2 peak. Normally shiny gray, niobium when exposed to air at room temperatures develops a bluish tinge. This color makes niobium attractive for use in body piercing jewelry. 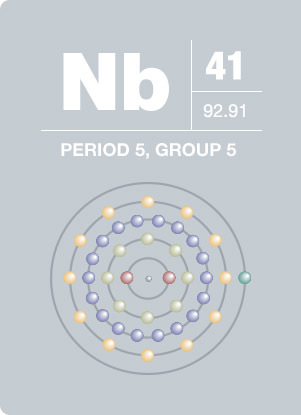 Niobium is chemically very close to tantalum. Niobium is a compound in some stainless steels and is an alloy of other nonferrous metals, such as those used in pipeline construction. This element is a Type II superconductor, which means that it remains a superconductor even in high magnetic fields. Niobium gets its name from the mortal Niobe, of Greek mythology, who turned to stone after she wept for the loss of her children and husband.